Students learn about app development and design as part of the Entrepreneurship & Innovation MSc programme at Surrey Business School; it involves hybrid online/ offline teaching in conjunction with London App Brewery; a London-based start-up company specialised in teaching app development skills including design, coding and marketing apps. This initiative developed over past 3 years by MSc Programme Director Jim Sears, combines theory with practice as students come to grips with the design process for apps before actually coding a series of apps and then learning about digital marketing techniques to launch apps. 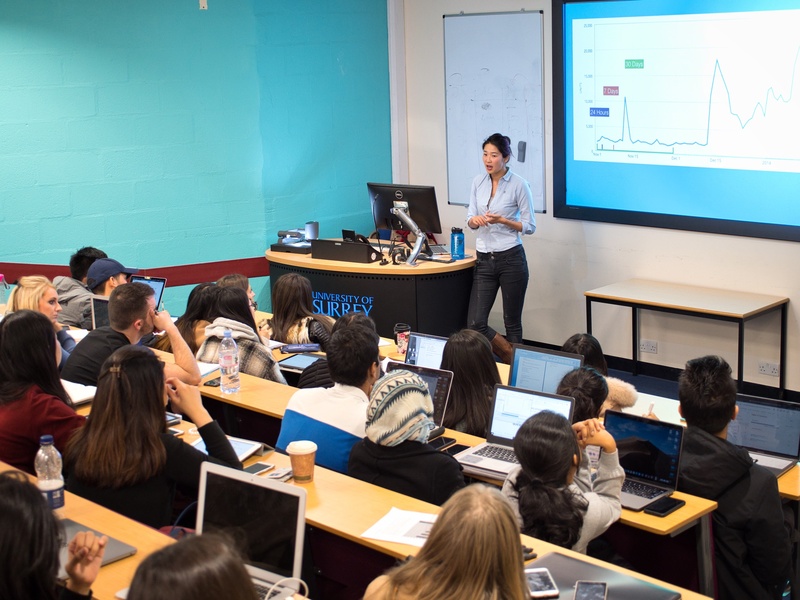 As part of the module, students interact with Philipp Muellauer and Angela Yu, co-founders of London App Brewery and professional app coders themselves. Philipp is a self-taught Adroid developer and to date has taught over 25,000 students and worked with a number of corporates and organisations to make programming approachable and easy to understand. Angela is a developer with a passion for teaching and the lead iOS instructor at the company. She has helped thousands of students learn to code and change their lives by becoming developers. In onto itself, London App Brewery is a great example of Entrepreneurship in practice. We asked London App Brewery founder, Philipp Muellauer some questions about his experience working with our students. Can you share some background on your company and what you do? At the London App Brewery, we’ve been teaching people how to create apps and websites since 2015. On a personal note, my love of programming came about trying to automate parts of my job. It was then that I discovered its creative potential. With this tool at my disposal, I could create anything – out of my bedroom no less. Imagine that. With apps, in particular, you can send your creations out into the world and have them run on the most personal device any of us own: our mobile phone. Gone are the days when one has to call a (mildly interested, but polite) friend over to one’s computer and say ‘Hey, look what I made’. The London App Brewery exists because we want to share the joy of programming and empower people to bring their ideas to life. Why did you decide to partner with the MSc Entrepreneurship programme for this project? We wanted to provide students with windows into a range of possible futures. Do they want to create their own product? Is programming for them? Do they want to build their own company? During our course, students learned how to design and create a prototype, how to program as well as how to get their first users; in short all the key skills needed to create and launch a tech product. Hopefully, we were successful in seeding the idea that they too can build an app and bring their own ideas to life. What have you found most interesting about this project? Our project with the Entrepreneurship MSc programme was quite novel in that it was integrated into the curriculum as a hybrid course, meaning the course content was delivered to students through a combination of in-person lectures as well as online tutorials, coupled with real-time support over a dedicated Slack channel. This meant that students on the programme were not only able to get all their questions answered right away during the tutorials but also continue to have access to the course materials afterward. That way the students can continue their learning journey and learn to build even more complex and challenging projects. What has been your favourite part about working with the Surrey MSc Entrepreneurship students? Our favourite part is always interacting with students, especially during the Q&A sessions at the end of the lectures. Surrey students are incredibly engaged and don’t shy away from asking the tough questions. They were interested to learn both from our personal experiences as well as find out how our business actually operates. What our students had to say…. In my opinion, I think not only how to generate the app coding and design are helpful, but how to advertise the app using the knowledge from app marketing and analytics were very useful. This can make people believe more in our product and the effects not only apply on the app, but it also useful in other online sites that bring valuable income to my business. Learning about the Xylophone App has been my favourite because of it’s an actual app that can be used in daily life. However, in term of business, I think the Pop App will help me the most to understand how to apply the app in the market and predict how an app pattern should be in future. Working on this module made me aware of the ways I could develop and test apps. Moreover, I have understood that by learning to code you can bring your ideas to life. It can be the starting point of the business too. Furthermore, the module empowered me to think differently. When developing apps, my approach towards problem-solving changed. I also learned the process of breaking the problem and looking for logical solutions. Additionally, the module made me a lot more patient as testing the process is difficult but it is a delight to see the app when the process completes. It is a practical module altogether! This project has undoubtedly developed my digital skills. I was introduced to Android Studio and I was able to build basic apps into animated apps. Moreover, I learned to create and integrate the designs digitally. I also learned about the different languages that can be used (for example, Java) and I have also understood how Android and iOS coding differ in real life.